The giant invasive grass arundo (Arundo donax), one of the weeds targeted under the USDA-ARS-funded Delta Region Areawide Aquatic Weed Project (DRAAWP), has been re-acquainted with one of its natural enemies imported from arundo's native range. A tiny insect called the arundo armored scale (Rhizaspidiotus donacis) has been successfully released in the Sacramento River watershed and in the Delta. Arundo forms dense stands across at least 10,000 acres in California, and over 100,000 acres in other arid riparian areas such as the Lower Rio Grande Valley of Texas and Mexico. Other control methods such as herbicide application, mechanical removal, mowing or burning have been used to reduce arundo populations in California, costing tens of millions of dollars. However, arundo is a tough plant and takes advantage of human disturbance and fire in riparian habitats along creeks, sloughs, rivers and reservoirs. Arundo populations in California thus exceed the capacity of these other control methods. 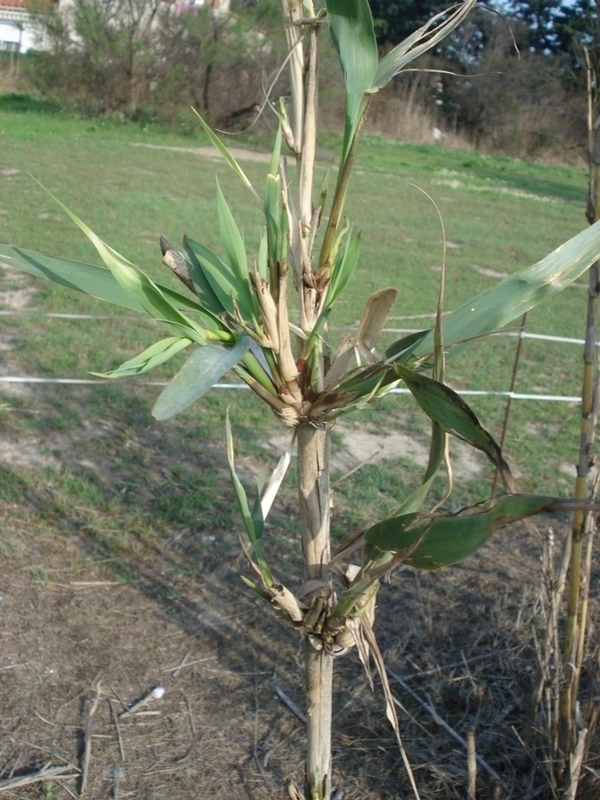 In the absence of control, arundo consumes and wastes scarce water – a single plant can consume as much water as corn when growing in moist soil under hot, sunny conditions. Dense arundo stands block access to water for irrigation and recreation, and also obstruct flood control structures such as drainage ditches. Arundo also displaces native plants and animals and alters geomorphology and water flow dynamics in riparian habitats in ways that make it difficult for the natives to come back even if the arundo is controlled. Biological control of invasive weeds focuses on the characterization, release and evaluation of insects (or plant pathogens) from the weed's native range into areas where the weed is non-native. The arundo armored scale was collected originally in southern France, Spain, and Italy. Studies by Spanish collaborators showed that, even in its native range with its own natural enemies, the arundo armored scale reduces shoot growth and rhizome size by 50%. Biological control agents undergo rigorous testing to ensure they are not a threat to native plants or crops. After a permit review process, the USDA granted a permit for field release of arundo armored scale in 2010. (This is one of two insects that have been released for biological control of arundo in North America.) Since 2011, this biological control agent has been released in the Lower Rio Grande Basin. Initial releases of this agent in California began in 2014, and it was found that the scale insect had become established at one site in the northern Sacramento Valley by November of that year. Armored scales are small insects that spend most of their lives in an immobile state, covered by their waxy secretions (‘armor'). Adult females produce ‘crawlers' that disperse locally (typically just a few feet) to find new buds coming up from the arundo rhizomes or lateral shoot buds above ground. The crawlers then lose their legs and antennae and insert their stylet-like mouthparts into the arundo tissue to feed on the fluids in the plant's vascular system. Crawlers molt to a second immature phase, and about six to eight weeks later, short-lived adult males emerge from their armor and mate with the immobile adult females. The females continue to feed and slowly develop embryos. A new generation of crawlers then emerges from the females. The life cycle takes four to six months. Top row, left to right: Tiny (0.5 mm) crawlers emerge from females and settle on rhizomes or lateral shoots. Second-instar immature scales continue to feed and expand. Winged adult males emerge from their oyster-like scale covering. Females (armored scale cover removed) are shriveled and skinny right after molting. Mature females are plump and turn a darker color when they are full of crawlers ready to emerge. Bottom row, left to right: Adult females form aggregations on arundo rhizomes and shoots. The presence of armored scale populations causes shoot distortion and reduces both shoot growth and rhizome size. In 2015, we tested a new release technique using arundo ‘microplants'. We soaked arundo shoot fragments in water for one month, then planted them in pots where they produced new shoot buds and roots. Armored scale crawlers were released onto the microplants. After about six months, we planted the infested microplants at field sites in the Delta – Andrus Island on the Sacramento River, and at Big Break near Oakley – and along Stony Creek in Glenn and Butte Counties north of the Delta. We established the microplants adjacent to large arundo shoots, and we cut off some of the established shoots to encourage production of new rhizome buds and lateral shoots. We watered the microplants as needed to keep them alive for about 6 months. Left to right: Microplant with gelatin capsules used to isolate scale crawlers from females (capsules had been opened and crawlers poured onto the base of the plant). Greenhouse bench with arundo microplants. Field plot with arundo shoots cut back to promote new shoot and rhizome growth. Base of an arundo shoot at the field site (arrow indicates location of adult female scales that developed from crawlers that had previously came out of the females on the microplants. Almost one year after planting, in November 2016, we sampled arundo rhizomes and shoots from the areas where the now-dead microplants were placed. At the Sacramento River site, 150 females were found, and at a site on Stony Creek in Butte County, 72 females were found. The females were placed in gelatin capsules to capture crawlers. A total of 1,668 crawlers emerged by early January 2017. Since there are still many more arundo shoots around the microplant sites, these results indicate that the arundo armored scale has established reproductive populations at three sites in California. This is the first establishment of this biocontrol agent in the state. 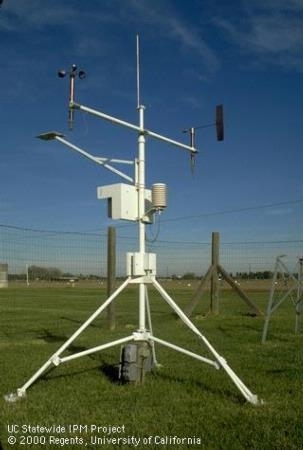 Additional releases are planned throughout the Delta and surrounding watersheds. Along with the arundo wasp (Tetramesa romana), the arundo armored scale is expected to significantly reduce the potential for arundo to grow, disperse and form damaging populations that threaten water resources. This work is conducted under the USDA-ARS-funded Delta Region Areawide Aquatic Weed Project (DRAAWP). This portion of the project is led by Dr. Patrick Moran (Patrick.Moran@ars.usda.gov) of the USDA-ARS Exotic and Invasive Weeds Research Unit, Albany, CA. Dr. Moran is working with a postdoctoral researcher, Dr. Ellyn Bitume (Ellyn.Bitume@ars.usda.gov), on this project. Contact us if you have questions. The Sacramento-San Joaquin Delta Conservancy (Beckye Stanton) is collaborating with USDA-ARS to identify field sites in the Delta, connect with landowners, and integrate biological control with their chemical arundo control program. Dr. Moran cooperates with landowners and local Reclamation Districts to obtain access to field sites.